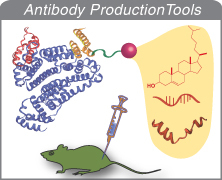 CellMosaic provides personalized hapten–carrier bioconjugation kits for antibody production. Typical haptens include proteins, peptides, oligonucleotides, and small molecules. Typical carrier proteins are keyhole limpet hemocyanin (KLH), bovine serum albumin (BSA), and ovalbumin. For large scale or projects beyond the scope of the PerKit™ configuration, please contact us for a quote.